Losing part of his right leg in a factory accident 55 years ago has not been a handicap on the lanes to 75-year-old Larry Weiland. The life-long Pekin, Ill., resident bowls with a prosthetic limb on his right leg, starting just below the knee, and he might be the most prolific one-legged bowler ever. “I’ve got about 14 perfect games now and two 800s,” says Weiland, who bowls regularly in three leagues and sometimes gets called to sub so often he finds himself bowling seven times a week. 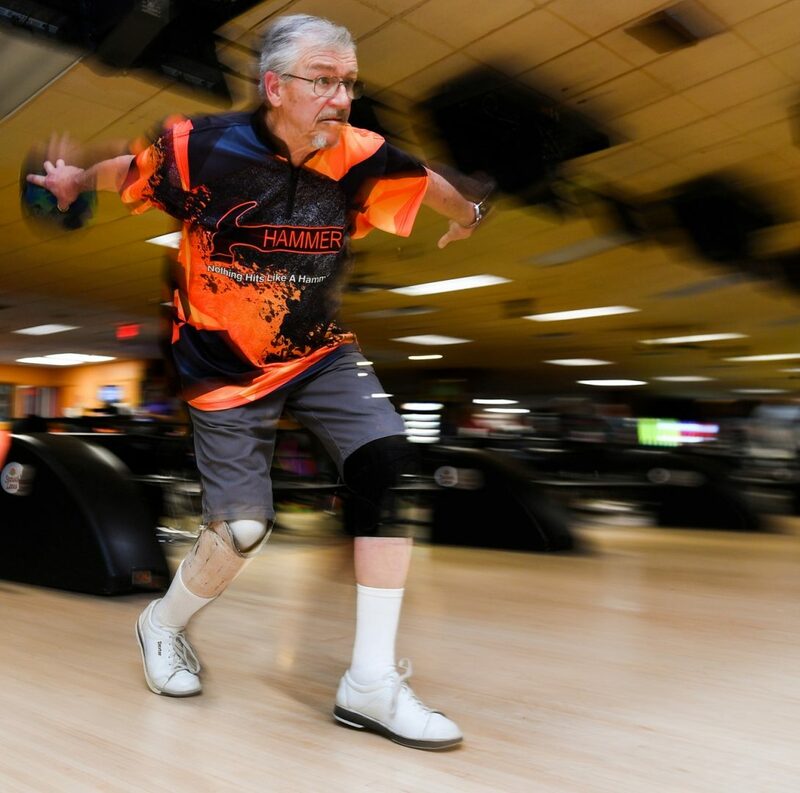 Weiland’s Way: Because he didn’t start bowling until after he lost part of his right leg in an accident, Larry Weiland never had to adjust to bowling with a prosthetic limb. The right-hander bowled his most recent 300 in 2016 and just missed one last season when he shot 299 amid a 779 series at Sunset Lanes in Pekin. “That was frustrating, because it would have been my first 300 at Sunset,” he says. 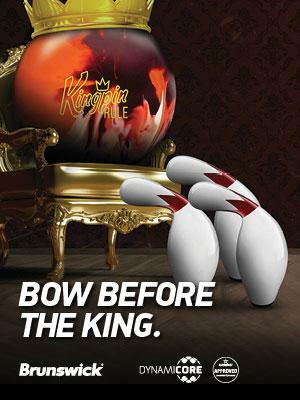 He finished last season with a 213 average at Sunset Lanes and had a career-best 220 average in the 2008-09 season. 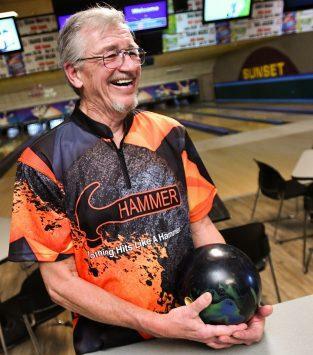 He has bowled well enough over his career to earn induction into the Greater Pekin Bowling Association’s Hall of Fame in 2014 — and not in the handicapped division. Weiland is divorced and lives alone, with no special ramps or grab bars in his house to help him get around. He’s had to learn to fend for himself ever since he lost the lower part of his right leg at age 20 in 1963. Because he didn’t start bowling until after his accident, he never had to adjust to bowling with the prosthetic limb. “I started bowling at Roxy's (another Pekin house) in the late 1960s,” he says. “I was averaging in the upper 180s. But I was never real good, because, until I retired, you just went bowling and had a good time. Weiland’s game really started to improve when he began bowling with some of the better bowlers in Pekin. 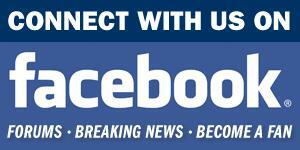 “I started bowling with my cousin, Jim Reader, his boy Jim Jr.,” he says. “I started listening to what they were saying about bowling balls and how to make deliveries, and I learned a little on my own, too. Weiland kept rolling 300s, then rolled the first of his two 800 sets in 2010 at Roxy’s. He had games of 300, 259 and 277 for an 836 series. In 2013, he shot 812 at Sunset. As long as he stays healthy, he doesn’t think he’ll slow down any time soon. Weiland also does not get any special treatment from the other bowlers in his leagues. And Weiland usually comes out on top, on and off the lanes — without handicap.